Aware of the connection between art and politics, many artists over the years have lent their names to social change. A couple films at this year’s Toronto International Film Festival document the ordeals of two world-famous artists sharing many similarities, albeit years apart. 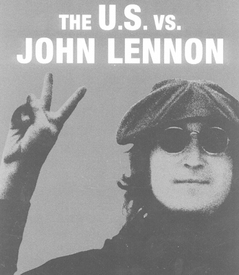 In “The U.S. vs. John Lennon,” directed by David Leaf and John Scheinfeld, we are reminded of the efforts Lennon made for world peace in opposition to the war in Vietnam, with songs like “Give Peace a Chance,” “Imagine,” and “Revolution,” and his “Bed-In” media events with wife and fellow artist Yoko Ono. The movie starts with the Ann Arbor, Mich., concert where Lennon sang his song to free John Sinclair, a radical journalist and poet, from prison. In the film Sinclair recollects Lennon’s commitment to social issues and how his appearance at the prison had an influence on Sinclair’s early release. It sparked the movement to free Sinclair with renewed optimism. The film describes how the influence of antiwar activist Jerry Rubin and Black Panther Party leader Bobby Seale on Lennon scared President Nixon and his gang, and how they in turn put Yoko and John through five years of hell with threatened deportation. The film utilizes rare archival footage showing Lennon’s personal involvement in political events of the time, and a new intriguing interview with Yoko, who appeared at the screenings in Toronto to answer questions from the audience. “War is over! If You Want It” buttons were given to everyone in attendance, noting the obvious replay of events in U.S. history and how relevant this film is to the current struggle against the war in Iraq. Lennon’s recordings, minus the vocal tracks, are used as a poignant soundtrack to scenes covering a range of subjects, from Attica State prison uprising to the civil rights movement. The visuals, many taken from still black-and-white photos, are brought to life in a novel manner. Faces were cut out of photos, shaded and made three-dimensional and overlaid over the background picture. While the background moved slowly back, the photos of the faces slowly moved forward with a stunning real-life effect of the person walking slowly towards the camera. The film received the highest accolade of all when Yoko proclaimed it her favorite film about Lennon, out of the many that have been made. From the best-selling male group of all times (The Beatles) to the best-selling female group of all times (The Dixie Chicks), from the war in Vietnam to the war in Iraq, from Nixon to Bush II, we span a couple generations. During this period there have been many artists thrust into the political arena, willingly and unwillingly. The reaction to her statement, particularly from establishment figures, was comparable to the fury unleashed after Lennon said the Beatles were “more popular than Jesus.” Well, we all know the Beatles survived, and so did the Dixie Chicks — but not without severe repercussions. Their music was banned from most country stations, their tours cancelled, and they were put through a struggle to survive in the music business. Their British manager, Simon Renshaw, held tight to the reins, and piloted the group through the rough tides, and the Dixie Chicks, with credit to their perseverance, refused to give in to radio boycotts, CD burnings and even a death threat. Barbara Kopple, America’s pre-eminent progressive documentary filmmaker, directed “Dixie Chicks — Shut up and sing.” Her Academy Award-winning films, “Harlan County,” about a coalminer’s strike, and “American Dream,” about the Hormel meatcutters’ strike, still stand as some of the finest examples of filmmaking in this country. Any serious progressive filmgoer should make it a point to view all of Kopple’s compelling and artistic works. “Dixie Chicks” was co-directed by Cecilia Peck, Gregory Peck’s daughter, and is extremely entertaining and superbly done. A treat for the huge Toronto audiences at the gala screening was the appearance of the Dixie Chicks and Barbara Kopple to answer questions and meet their fans. Whether or not you’re a fan of the Dixie Chicks, or even country music, the film will entertain and inspire you to stand up for your beliefs.